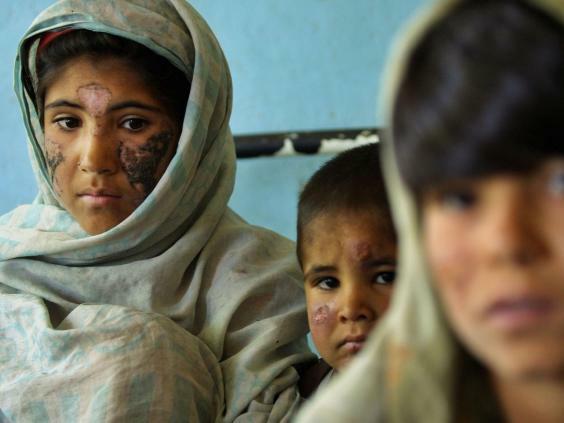 Cutaneous leishmaniasis is transmitted exclusively through bites from sand flies and can result in horrible open sores as well as disfiguring skin lesions, nodules or papules if left untreated. Leishmaniasis has been endemic in Syria for centuries and was once commonly known as the “Aleppo evil”. Until 1960, the disease's prevalence in Syria was restricted to two areas - Aleppo and Damascus. However, as Syria’s civil war continues the resulting refugee crisis has triggered a catastrophic outbreak of the disease, with the regions most affected under Isis control. Research published on Thursday in the scientific journal PLOS has found the disease is now affecting hundreds of thousands of people living in refugee camps or trapped in conflict zones. Around 4.2 million Syrians have been displaced into neighbouring countries and Turkey, Lebanon, and Jordan have accepted most of these refugees. As a result, cutaneous leishmaniasis has begun to emerge in areas where displaced Syrians and disease reservoirs exist side by side. “We're seeing lots of diseases, including leishmaniasis in these conflict zones and we need to ring-fence them, by providing access to essential medicines for cutaneous leishmaniasis sufferers living in conflict zones, or risk another situation like Ebola out of the conflict zones in West Africa in 2014,” Peter Hotez, dean of the US National School of Tropical Medicine, US Science Envoy to the Middle East, and lead author of the PLOS research told the Digital Journal.